The 2017 Club 21 Together is Better Walkathon will take place in Pasadena’s lovely Central Park on Saturday, October 21st. Hoping to raise $200,000 to fund programming for individuals with Down syndrome and their families, the event will offer participants a day of games, activities, friendship, and fun. We were pleased to chat with Kate Candelora, top team captain of Team Candelora for Club 21, to learn more about her experience with the Together is Better Walkathon. 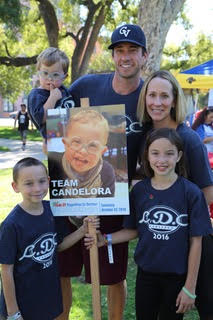 Preparing for their sixth walk, Team Candelora celebrates five-year-old Luca. The youngest of three children, Luca is a hilarious and smart kiddo who loves his siblings, playing at the park, and reading books (his current favorite is Duck on a Tractor by David Shannon). His most recently mastered running, and he enjoys running the bases at his big sister’s softball games. Luca would eat pasta every day, given the opportunity, and he counts Angry Birds, Minions, and Raffi among his favorite things. He knows he can make his mom laugh just by dancing in the back seat of the car, on the way to school. Luca is clearly adored by his family; this was evident in the way Kate’s voice sparkled as she described him to us. Kate received a diagnosis of Down syndrome while pregnant with Luca and was terrified. Her mother-in-law directed her to Club 21, which Kate tearfully visited, only to be welcomed with excitement by the Club 21 staff. She remembers thinking “They must know something I don’t”; they provided a whole new perspective on what to expect. With the support of Club 21, Kate was able to get over the initial shock of the diagnosis and enjoy the pregnancy. Kate’s initial experience was so helpful (she shared that she will “never be able to explain how important” Club 21 was), she recently took on a role as a parent mentor so she can help other families know that everything will be ok.
Kate also gives back to the organization by leading a top fundraising team for the Together is Better Walkathon. While the funding is crucial to the programming provided by Club 21 (Team Candelora raised over $12,000 in 2016! ), the awareness that her family raises by participating is just as important. Kate always kicks off her efforts by setting up their team’s page on the Stride fundraising site. She then sends out an email to all previous participants, which includes the date of the event and an update on what has happened in the course of the year. She describes the classes they’ve taken, the conferences they’ve attended, and Luca’s new milestones; anything that Club 21 has supported is mentioned in the email. Kate finds that people are “craving education to know about Down syndrome,” so she provides that. She also posts information once a week on her Facebook page and finds that even old acquaintances are called to donate to their team after learning about Luca. By using social media, Kate feels that she isn’t putting anyone on the spot; they can either read and then choose to donate or continue scrolling through their page. 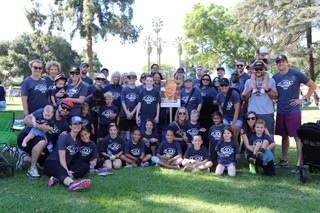 Her favorite memory from a walk was when her friend’s husband shared that he “walked out of there with a whole new perspective on Down syndrome,” after seeing all of the kids that Club 21 supports. It was really exciting for Kate to realize that they are helping to change the way others view Down syndrome. The event is not just about raising money; it’s also about educating the community about Down syndrome and raising awareness. Each year, Kate’s husband designs a t-shirt, and every member of their team receives one. The shirts are super soft, and everyone loves them. They also provide donuts, bagels, and coffee for the team, and then they all stroll around the park together. “It’s a fun-filled family event,” Kate described. “There’s something for everyone, and you walk away feeling good.”. Because of the support that the Candeloras receive from Club 21, they feel that they are just a “normal family”, because “parenting Luca is no different than parenting the other kids”. Kate wrapped up our conversation by telling us that Club 21 is “so amazing”, and she feels “so blessed to have found them”. For more information about Club 21, please visit their website.